Orange Street residents Pam and Deb have adopted two more stray cats. The cats were found wondering around Orange Street. Domino is a good cat and Buttercup is friendly too, according to Pam. 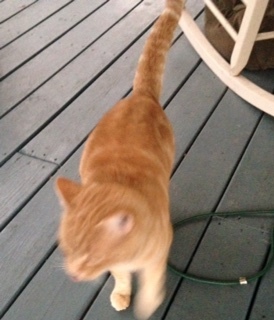 This entry was posted on December 31, 2014 by Hilde Kate Lysiak and tagged Hilde Kate Lysiak Bridget Lysiak, Orange Street News, selinsgrove, stray cat.